Capsella bursa-pastoris - Natural Health - Lancaster and Preston . Capsella bursa-pastoris (medic) is commonly known as Shepherd's Purse. It is part of the Cruciferae family and the aerial parts which are used in herbal medicine. 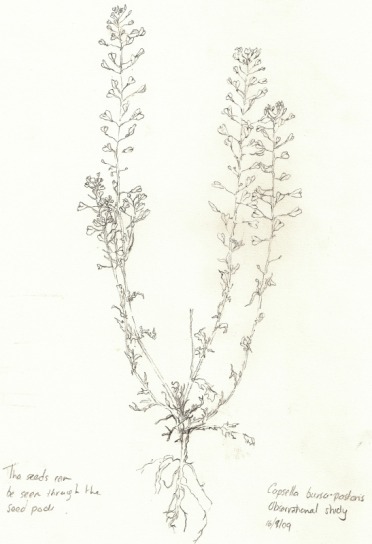 Shepherd's purse is a common weed and can be found by paths, in gardens and wasteground. It is easily identified by its seed pods which are heart shaped, resembling leather sling purses of shepherds. It grows up to 40 cm in height. The base-leaves have two pointed lobes and the upper stem leaves are small. Shepherd's purse also has small white flowers which are long-stalked and set in a cross form. Medicinally it is mainly used as an antihaemorrhagic being employed primarily in the treatment of menorrhagia - profuse/prolonged menstrual bleeding. It is important to see a health professional if you suffer from heavy periods in order to obtain a diagnosis and correct treatment. Note: avoid in pregnancy and lactation.